I bought this leopard sunglasses at H&M yesterday and I found them really funny. They remind me a little of those by Alexander Wang for Linda Farrow, but of course they are not as outrageous as they are.. gosh, how I want them!! Anyway I was wearing my ripped jeans and I believe "ripped is never too ripped" but I somehow managed to rip them really strange, so a piece of the jeans was kinda sticking out, so I basically had to tie up some of those threads to make them look better. I guess they look ok now, I'm just not sure how long will those tied threads stick together! 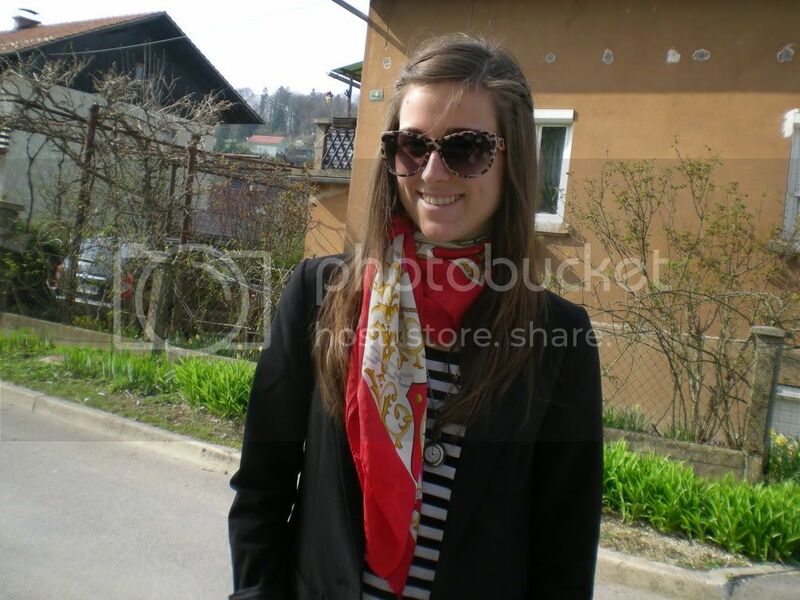 Wearing TopShop jeans, H&M shirt, blazer, sunglasses and boots, vintage scarf. Love the contrasts of this look..the sailoresque upper part and then the punkish/rock chic bottom! Great! And you're only 18? Happy birthday! !